show - Budgerigarworld.com - The international website for the hobby worldwide. A website all about Budgerigars. All Entries Tagged With: "show"
Results from the first ever Ukraine national budgerigar show. Results & photos from the 23rd UK Specialist & Rare Variety Open Show. How does the professional approach the task of preparing the team for the showbench? Having staged a successful Convention in June 2010, the Budgerigar Society is turning its attention to stage another event this May labelled the Woking Event. 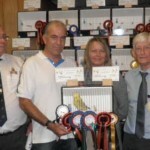 Results and photographs of the 2010 Swiss BS national show. Photos of many of the wining birds from the 2010 Budgerigar Society Club Show. Come and meet many of the world’s top breeders at the Budgerigar Society Club Show at Doncaster on 2nd – 3rd October, 2010. Photographs and results from the Australian National Budgerigar Council 36th Annual Show, which was held in May/June 2010 in Rockhampton in Queensland. Details have been sent to Budgerigar.co.uk of the forthcoming 37th Australian National Budgerigar Council Championships to be held in Canberra in May/June 2011. Vitamin D that is lost in this way should be replaced artificially via multivitamin solutions and / or cod liver oil bought from your pharmacy. The desire to breed super exhibition budgerigars is the ambition of every fancier in every country. I am well aware of the fact that the Australian show scene and its structure and administration is different to the UK. That aside, we all have the same aim as it is the finest birds on display that we wish to breed and own for the simple reason of pride in having achieved something that money cannot buy. There is no doubt that the start to any season is the most difficult. I can tell that the birds are ready to breed by looking at the behaviour of the hens as well as their condition. All my flights have the sexes mixed year round. This is because the current year stock learn their sexual habits very early. If you keep the big hens separate they just sit in the flights and get overweight with predictable poor results. Mix them and keep them active. One has to remember that today we strive to breed bigger and better birds. General feeding apart, you must always provide grits which possess granite like particles (insoluble) and shell particles (soluble). Not only should it be given but it must be changed every week to every pair. There are a few breeders who have woken up that they have to attack quality now or give up. That is why I have attacked that myself and built up a great depth of quality so that breeders know they have a good chance of getting something to improve what they have at home. There are few aviaries around with the quality depth – perhaps only 10 in total in the UK.